We are looking for HGV Class 1General Haulage Drivers (on curtainsiders) for 2019 at our Fakenham depot. **PAYE only. **Ongoing contracted work with an average of 58-60 hours per week. HGV Class 1 Drivers required for our Norfolk depot (in Fakenham) - Just over 100 miles from London. You need to hold a full HGV C+E Class one licence, (Minimum of one year artic experience,) along with a valid Driver Qualification Card. (CPC). We are open to HGV Class 1 drivers across the UK and Europe. Quick start available for those suitable candidates. 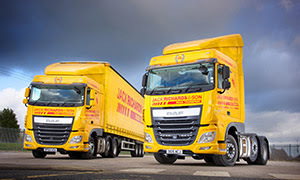 Many of our drivers have been with Jack Richards & Son for 20 years plus. Monday - Sunday: 5/6 days or nights per week tramping. Between 4-5 nights out each week. Pay: Between £10.00 -£11.75 an hour depending on if you work days/nights.Higher rate without accommodation. High standard accommodation also provided for your rest days at NO ADDITIONAL COST. (For 10 night per 4 weeks for drivers rest days.) Not compulsory - if you do not require the accommodation, there is a higher pay rate. As part of our driving workforce you will receive additional benefits. (See below). Drive a DAF, (our average fleet age is 18 months). Holiday pay based on average hour earnings. Please ensure to include your current telephone number and email address in your application. Email your details and CV to our recruiters and we will call you within 24 hours of your application being received. Please send via Indeed or via our company website if you are suitable for the role. Please mark your application "5/6 ATD"and please provide contact details.